They are You and Your Pet: Puppy by Jean Coppendale, Know Your Pet: Dogs and Puppies, by Michaela Miller, and Life Cycles: Puppy to Dog by Camilla de la Bédoyère. 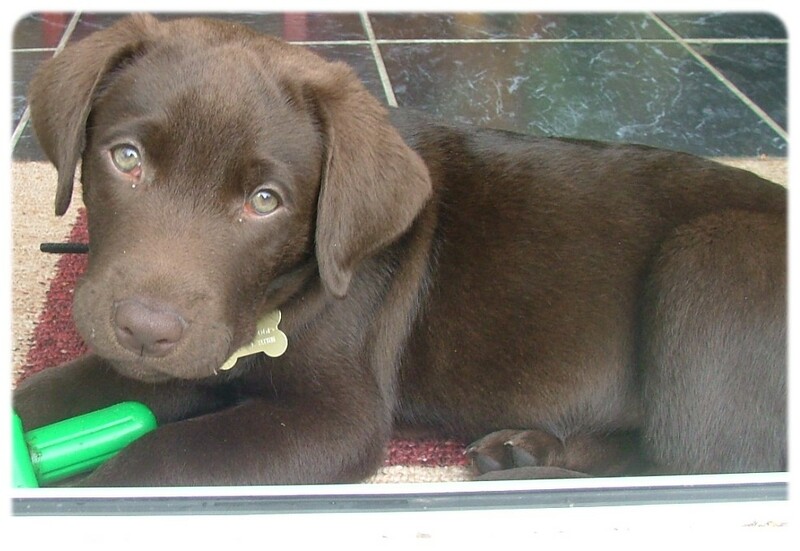 Bear, our chocolate Labrador puppy! This title was read my daughter (6) and is very obviously for younger readers (the recommended age is stated as 7+ by the publisher). Each double-spread is not overwhelmingly crowded, allowing new readers like my daughter to access the text without making it daunting. There is still a lot of information included in the book, and it took my daughter a long time to read it all, but she did read it all eventually (a long car journey to Italy helped free some time to focus on reading -lucky for them my two children can read in the car, while I find it impossible!). I think the tone of the text is particularly fitting to its audience. The book aims at helping young children through the experience of getting a puppy by giving practical advice on how to look after the puppy, as well as some tips. There is quite a lot covered in the book, but it is never overwhelming. My daughter enjoyed passing on the information to us, and the book also includes some “parents points” which I found to be a great feature. It is not as easy to “share” a non-fiction book with a child as it is with a story book and those parent points encourage parental involvement in the child’s reading of the book and sharing ideas and information on the subject. This is particularly important when dealing with the information on losing a pet. I also thought the “puppy checklist” at the end of the book was a great feature, emphasising the focal points on concise way for young readers. There is an index at the end of the book, but rather than a glossary, there are “puppy words”, keywords used within text to convey their meaning. 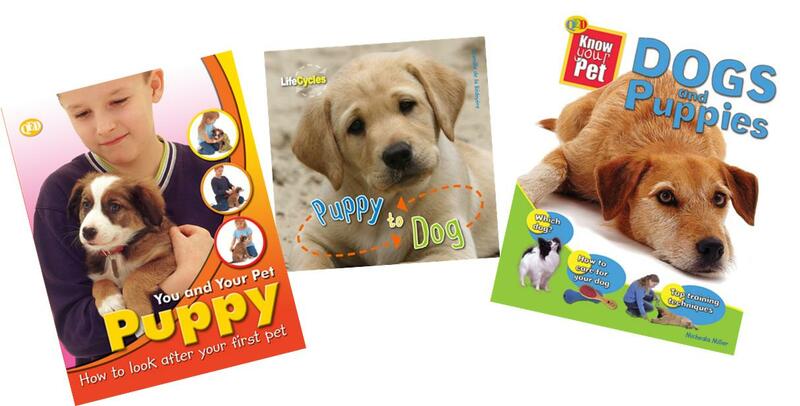 This is a great series which will be really useful to little readers who own or are about to own a pet. Other titles in the series include: Kitten, Mouse, Hamster and Gerbil, Rabbit, Guinea Pig, and Rat. This title was read by my son (nearly 9) and this series is very obviously for older readers (the recommended age is stated as 9+ by the publisher), with denser text, and my son naturally picked it up. The book goes into much more detail than the previous title for this reason and includes information about grooming and handling. The text offers a much more “hands on” approach to one’s dog, giving instructions on aspects of training for example and is overall a much more comprehensive guide on owning a dog. There is a very interesting double-spread on dogs in the wild also, which my son really enjoyed. Again there are notes for parents and teachers, ensuring that best use is made of the information and that there are points for discussion. To be quite honest both myself and my other half have read chunks of this book and learnt a few things about how to deal with our puppy too! The layout of each double-page has been well thought through using an array of features to convey the information in an attractive way, and this works very well. The pages are quite busy, which might be a bit daunting for more struggling readers and those at the lower end of Key Stage 2, but they will be able to access some of the text if not all, as it the layout allows for some amount of “dipping in and out”. This book is definitely for an older audience but ticks all the boxes: it is informative, attractive and vibrant. Other titles in the series include: Cats and Kittens, Rabbits, and Horses and Ponies. This book was always going to be a hit because of its cover! Isn’t that puppy just gorgeous? Actually this was the most interesting title of the three for me, because of the more complex subject it covers and the younger audience it is aimed at (the recommended age is stated as 4+ by the publisher). Again, in this title, the text is pitched perfectly at the intended audience. The layout enhances the information rather than overshadowing it, using labels, diagrams (I loved the puppy-to-dog picture diagrams! ), differing fonts, bold typeset, and a good use of colour. There is a glossary and an index and also information for parents and teachers. My only criticism with this book is that despite dealing with life cycles, it does not approach the subject of death, which I think would have been appropriate. But this is otherwise a gorgeous book which will work at home as well as in the classroom or school library. Other titles in the series include: Acorn to Oak Tree, Egg to Bee, Egg to Penguin, Fry to Seahorse, and Snakelet to Snake. I found those three books to be incredibly well laid-out and well pitched to their audiences. The spreads are attractive, colourful and well illustrated. My two children really enjoyed reading these books. When I asked them what they had liked about the books, the consensus was that although they had enjoyed reading all the information, what they had most enjoyed was all the photographs of different breeds of dogs. And it is true, they spent hours looking at and talking about the pictures inside the books. This is by no means a criticism; the books are informative and well-pitched but one of their main strengths is the impeccable design of each of them. This is very important in children’s non-fiction as it helps children to access text. You can see that great care has been put into working out the best page design within each book. I had never really heard of QED before and was very impressed by the high quality non-fiction they produce for children, especially at the younger end. A very good discovery indeed! Thank you to the lovely Tasha at QED for sending me review copies of the above titles. Hi melanie, thanks for sharing these for nonfiction monday. I have never been a dog person and don’t think I ever will be (I was scarred for life by lots of dog slobber from my aunt’s very slobbery dogs as a child), but I wish you and your family lots of fun with your new family member! I think you are either a dog/cat person or not. I am not a cat person at all!